You have to be careful when attending a renaissance festival. Some of those in attendance take historical accuracy very, very seriously. Whipping out your smartphone could lead to a night in the stocks, and trying to film the festivities with a flying drone will incur an even worse fate for your quadcopter. 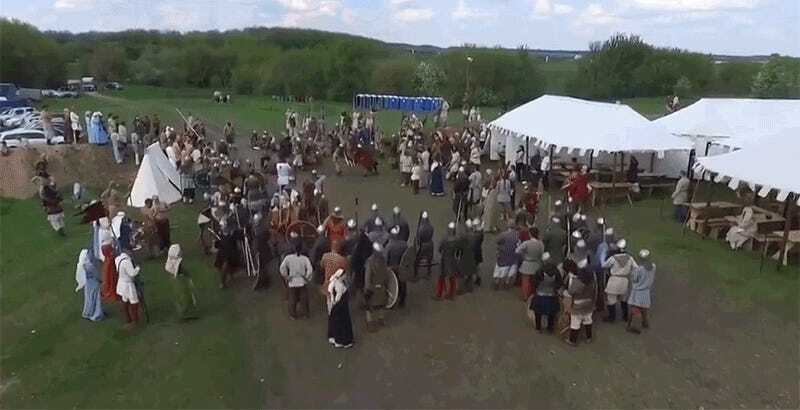 At a renaissance festival in Russia, one costumed participant took preserving historical accuracy into his own hands by bringing down a drone buzzing overhead with nothing but an impressively accurate spear toss. It doesn’t appear as if anyone was hurt by the crashing drone—royalty or peasants—but the locals were presumably concerned about what manner of witchcraft or wizardry was keeping the magical craft in the air.